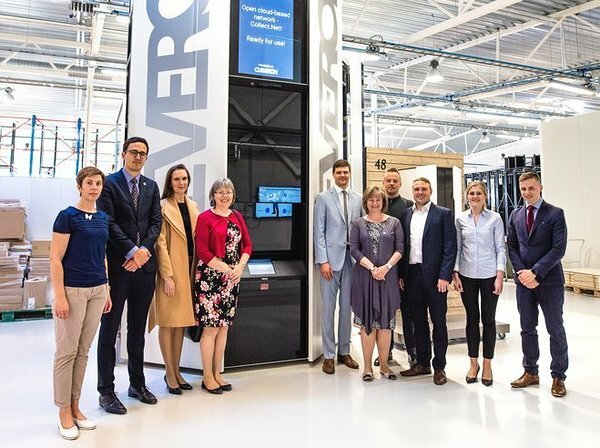 On May 10, Cleveron welcomed British Ambassador to Estonia Theresa Bubbear and the delegation of the British Embassy in Viljandi development centre. Our representatives introduced Cleveron’s last-mile delivery technologies and gave the guests a tour of the facility. The Ambassador also had an opportunity to personally test what it’s like to retrieve a package from our automated self-service parcel solution PackRobot. In the following meeting, we discussed Cleveron’s plans in the UK and the firm economic ties between Estonia and the United Kingdom. Cleveron is a good example of the cooperation since our products are also present in the UK market. The PackRobot offers parcel collection and return solutions for ASDA (it is known as the Parcel Tower) and from May 2018, Zara’s radical new, technology centred flagship store in Stratford, London has two CleverFlex parcel terminals. They make the store’s click and collect parcel collection experience as fast and convenient as possible. The Ambassador’s visit was part of the British Embassy’s "pop-up embassy" tour across all counties of Estonia to celebrate 100 years of friendship between our two countries.